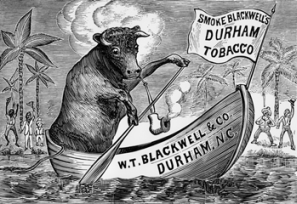 Seeking a name for his manufactured smoking tobacco shortly after the Civil War, John R. Green of Durham drew inspiration from a popular brand of mustard made in Durham, England, that featured the head of a Durham bull on its label. Green chose to use the image of a whole bull, and his trademark-soon the subject of extensive litigation to protect it-became one of the most recognizable product advertisements in the country. Green made William T. Blackwell his partner in 1867, and when Green died two years later, Blackwell bought the entire business from the Green estate. Subsequently, with James R. Day and Julian S. Carr as his partners, Blackwell led the William T. Blackwell Company to a dominant position in Durham's burgeoning tobacco industry. Bull Durham smoking tobacco was widely advertised and was one of the world's best-known American products of the late nineteenth and early twentieth centuries. The 1988 blockbuster film Bull Durham, starring Kevin Costner, Susan Sarandon, and Tim Robbins, brought national attention to both the famous tobacco moniker and the Durham Bulls, Durham's popular minor league baseball team. William K. Boyd, The Story of Durham: City of the New South (1927). Nannie M. Tilley, The Bright-Tobacco Industry, 1860-1929 (1948). It sounds like you may have a copy, or possibly an original, of the 1879 advertisement shown in the illustration to this NCpedia article. If so, you may want to consult an antique or rare book dealer. The NC Museum of History may also be able to help. Here is a link to their page -- "Contact an Expert" http://ncmuseumofhistory.org/Collections/Contact-an-Expert.